As sub-consultants to Grimm & Parker Architects of Calverton, Maryland, L.S. Grim Consulting Engineers was the mechanical, electrical, and plumbing engineer of record for the George’s Creek Library. 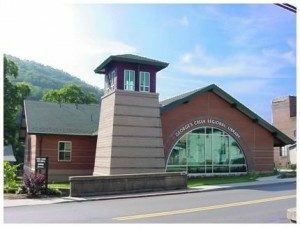 George’s Creek Library is a branch library and a part of the Allegany County Library System, located in the town of Lanaconing, Maryland. The project consisted of the creation of a new branch library in the center of the town. L.S. Grim Consulting Engineers was responsible for the central HVAC systems for the storage of various display and artifacts within the library, as well as the general stack book storage. We were also responsible for the general and specialty lighting located within the Heritage Room and the general stack area of the library. This consisted of a new service entrance from the power company, various conveniences, and power systems designed to the various components of the library, Category 5 data and telephone cabling and internet access for the library, as well as handicap accessible plumbing facilities and other normal and customary items that would be located within the library.